In this class the students will be introduced to the technique developed by Deb Tucker from Studio 180 Design. 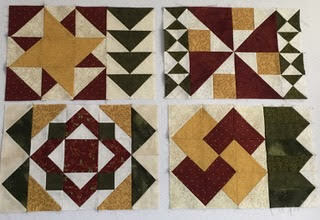 Deb’s technique has you create an over sized unit and then, using her tools, trim the unit down to a precise unit that will fit together better and give you a better result in your quilted items. Students will learn to make 4 different units with the Tucker Trimmer 1 tool and then learn to make crisp, clean flying geese in a quick manner with the Wing Clipper tool. With this being only a 1/2 day class the students will learn how to create the units and will be given sheets with several other patterns for their place mats that they will be able to make later at home. There will be some pre-class cutting of scrap material to practice on in class. Required Supplies : Studio 180 Design Tucker Trimmer 1 tool $20, Studio 180 Design Wing Clipper Tool $22, Magic Wand $5 or ruler to draw diagonal lines. The 3 items above may be purchased from the instructor.